Kids diets…encouraging kids to eat properly benefits everyone. Busy lifestyles and a multitude of distractions make it very difficult for kids and families today to eat a meal together. Most of us at the orthodontic practice of Lisa P. Howard DDS MS often find ourselves eating on the run between busy work schedules, dance lessons, sports practices and games, school activities, karate lessons … the list is endless. Not to mention how difficult it is to steer our kids away from the distractions of computer games and TV. Getting your kids to sit still for an entire meal is difficult, but is important when developing good eating habits that will benefit them throughout life. Dr. Lisa P. Howard DDS MS would like to offer you a few tips that will encourage good eating habits for your kids that will benefit them as they move on in life. Our kids are constantly bombarded with advertising for all kinds of media promoting junk foods which warp their perception of good eating habits. Educating our kids at an early age, along with teaching by example, is crucial to their develop at an early age. We understand this can be tough when everyone is going every which way, but eating together as a family has been proven to benefit the eating habits of kids and parents alike. Serving a healthy meal with correct portions at the dinner table, not only encourages communication which develops family ties and interpersonal skills it prevents overeating. Taking time to eat a meal also allows our bodies to pay attention to our stomachs’ signals. Our bodies will tell us when we have eaten our fill, but watching TV while eating or engaging in another activity will distract children from recognizing they are no longer hungry, leading to overeating. Paying attention to what we eat and the size of portions is a cornerstone of diet programs. Taking the time to educate our kids while young, as well as watching our own portions, encourages a healthy lifestyle. Television, video games, or other sources of distraction prohibit a structured eating time. A family meal together allows parents more control over the eating habits of children, reminding eaters to slow down, eat some vegetables with their meat, with their mouths closed… and so on. For children, this usually means a portion of one of their favorites and one portion of veggies. This reinforces the need for a balanced diet that will remain strong into adulthood and it gives parents a bargaining chip. Try asking your child to eat one bite of veggies for every two bites of their favorite item. This method teaches children to focus on the flavor they prefer while still eating their vegetables. Healthy foods such as carrots with ranch dressing, french onion dip or peanut butter and raisins with celery encourage good eating habits. Finger food is more fun than food they have to cut up to eat while encouraging kids to do what parents want all at the same time. 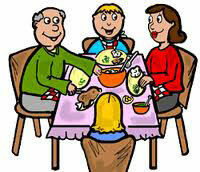 What tips can you offer busy families trying to improve their kids diets, eat together and share a healthy meal? Please leave your comments below. Also, please feel free to contact our office with any questions or to schedul a complimentary initial consultation for you or your child.